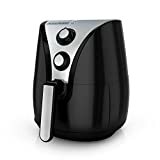 The BLACK+DECKER Purify 2-Liter Air Fryer has long been one of Amazon’s best-selling models. In fact, it even has a coveted “Amazon’s Choice” designation because it’s rated so highly. The Purify air fryer has dual convection fans for even crisping across the entirety of its 2-liter capacity. The results are delicious, making the fryer worth every penny at its $150 retail price. Grab one today on Amazon, however, and you’ll spend just $69.52 after a discount and a 10% coupon on the site.